"La canzone dell'amore perduto" was written when things were no longer going well between De André and his first wife "Puny" Rignon, though they continued to live together for a while. It's interesting that De Andrè wrote this break-up song from the woman's point of view. The song was extremely popular and was covered by many other Italian artists. The music is from Georg Philipp Telemann (Adagio from "Concerto in D Major for trumpet, strings and basso continuo"). And a tiny bit of tenderness. 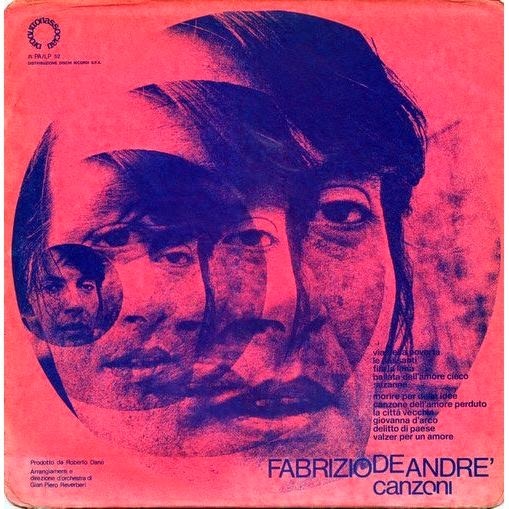 Canzoni, released in 1974, was a "filler" album, like Volume III, desired by De André's label. The only three previously unreleased songs here are covers of Dylan's "Desolation Row" and of two songs by Georges Brassens. Also included are two covers of Leonard Cohen songs.